I have been looking for an iPad Twitter app ever since the iPad came out and I think I’ve finally found it. This brilliant little app made by Stone Design called Twittelator for iPad gives me exactly what I was looking for and things I didn’t even know I wanted but needed are included as well. Twittelator for iPad will let you do practically anything you would want to with your Twitter accounts on your iPad with a very creative and fun to use two column interface that dares to be different. I looked and poked around for hours and still couldn’t find any major gripes with this app. Twittelator is basically the missing link and (especially in landscape mode) is an absolute joy to use. Instead of using the left section of the app as a menu system like most other apps, Twittelator dedicates the left side to a window that always displays the latest tweets in your account in what basically represents an elongated iPhone screen. 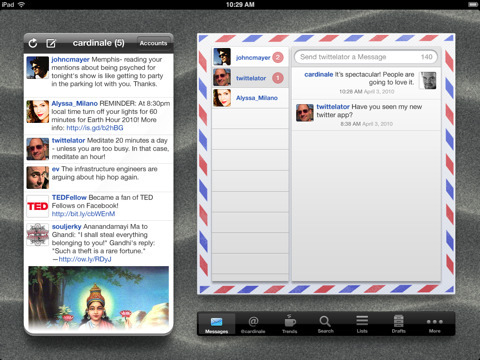 With all its features, Twittelator has a lightweight feel on the iPad. It uses empty space and big wide margins to bring focus and reduce the clutter on the screen. On the right side you have a bigger screen that can be populated using seven main tabs with Twitter content including Messages, @Mentions, Channels, Search, Lists, Drafts and More. In portrait mode you only get one pane and a Friends tab is added to your black toolbar which becomes the default section. Multiple accounts are supported and switching is fast and simple. Remember the retro red and blue air mail envelopes? You’ll find your direct messages tucked into a neat virtual letter with all your DMs listed. Mentions are listed on the right with a simple refresh button. You can also drag down to update as in Tweetie. Channels is a new feature in Twittelator that is basically like a directory of topics. I’m not sure what service or logic is behind creating the Channels but it’s a neat idea. From the surface it seems like the Channels are somehow tied into Twitter’s Lists but still having them simplified in this format is wonderful. It would make sense for Twittelator to inform users how this feature works and maybe give them the ability to add and remove users and topics/channels as well. Search lets you find tweets by Keyword, Location or People. Location search shows tweets on a map in your surroundings if you let Twittelator use your GPS location. People search lists people that match your query. Speaking of people, tapping on any user slides in a very well designed Profile screen with vital stat counters like Friends, Tweets, Followers, Favorites, Lists and even a link to edit your own Profiles (including Name, Location, Website and Biography). The lists tab shows lists that you follow, are following you, and that you’ve created. You can search for lists by topic and recent search history is saved as well. Again the line between Lists and Channels is a little blurry and it seems like there might be some overlap going on there too which should be cleared up. Drafts in Twittelator for iPad are awesome using the yellow notepad design to distinguish them easily. You can create as many drafts as you want and save them in your iPad till you’re ready to post them. You can’t schedule your drafts yet but you can lock them to avoid accidental future edits. Speaking of posting, the interface for writing new tweets is packed full of goodies. In addition to the basic iPad keyboard, you have buttons for photos, geotagging, hashtags, a contact list (of people you follow), smileys, shrinking for both links and tweets, privacy settings, and more. On the iPad, Twittelator lets you pick photos from your Library Media or Record Audio to upload as tweets. Geotagging if enabled lets you insert a map link with your tweets. The hashtags menu is your own customizable personal list of commonly used hashtags that you can quickly add to outgoing tweets. A simple to swipe smileys menu lets you pick from 13 pages of special characters, both black and white html entities as well as Japanese Emoji icons to your tweets. A slide to send button prevents accidental tweeting. Individual tweet messages can be read in their own small windows. From there the arrow button opens the options menu where you can Retweet, Quote Tweet, Mail Tweet, Translate, Copy, Private Message, Delete your own stuff, Reply, Star, as well as Send to Instapaper for added bonus. The more tab takes you to Trends, the Everyone public timeline, Retweets, and your Profile section. From here you can also access the Twittelator for iPad settings. Settings let you pick a wallpaper to be used as the desk in your app. You can pick from the 7 provided (I love the dark wood bg) or add anything from your own Photo Albums. Other settings include adjustable font sizes, display name, inline photo tweets, and composing options like quotes, image uploads, auto correction, and auto capitalization. Services supported by Twittelator for iPad include Photo (Moby, Pikchur, TwitPic, Yfrog, TwitGoo, Posterous, TweetPhoto, WordPress and TwitLens) Audio (Moby, Posterous) link shorteners (bit.ly, j.mp, piurl, href.in, is.gd), plus Posterous, TweetPress, Instapaper, ReadItLater, and OmniFocus. If you’ve been holding off for a killer Twitter app for your iPad, this is the one. Twittelator exceeds expectations in all levels including design, performance, functionality and usability on the iPad and is worth every penny. AppSafari review of Twittelator for iPad Twitter Client was written by Joe Seifi on May 10th, 2010 and categorized under App Store, Chat, Featured, iPad apps, News, Productivity, Reading, Utilities. Page viewed 3895 times, 5 so far today. Need help on using these apps? Please read the Help Page.